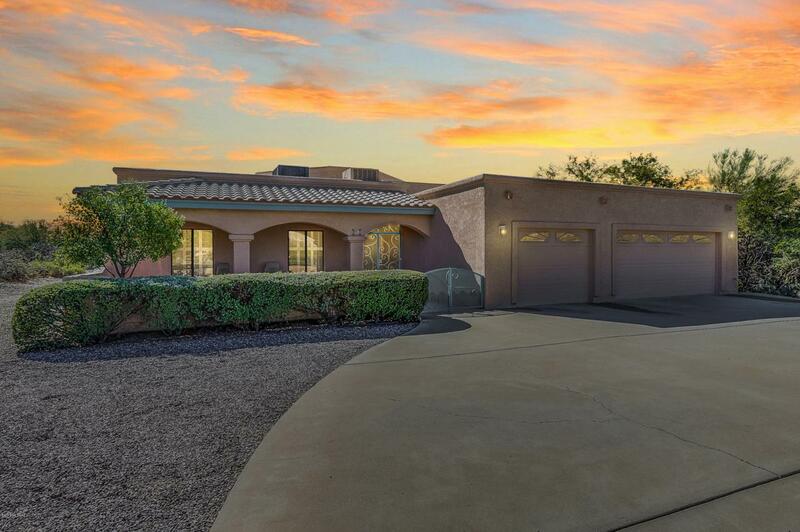 This spectacular home is nestled on a cul-de-sac lot that hosts gorgeous desert landscaping and mountain views! A large circular drive welcome you from the curb. Unique plant shelf embraces this living room! Plantation shutters! The master ensuite is complete with double sinks, separate tub and shower and lovely cabinetry. This spacious kitchen hosts ample cabinetry, stark white appliances and unique overhead lighting. A pantry and dining area area options add the finishing touches. Bring the office home if you have to and take advantage of this den with a multitude of bookshelves. Step out onto the covered back patio and take in the sparkling pool, spa and lush grass. The landscaping provides shade trees and palms. AZ outdoor living has never been better! See this home today!